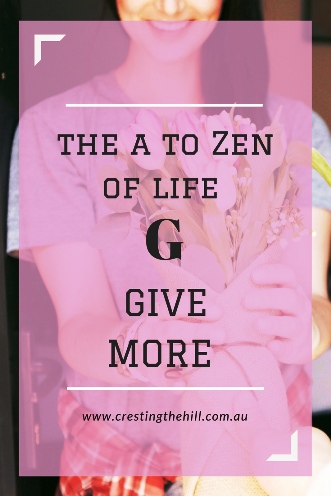 The seventh letter of my A to Zen of Life (via the Dalai Lama) is G for Give More than you planned to. Don't be stingy in your giving and don't resent or put conditions on what you give. Those of us who live in a time and place where we earn more than we need have the opportunity to give some of it away. If you are in that position, give it without strings attached - I remember receiving a small amount of money from my father once that came with a list of suggestions that he thought I should use it for. This takes away some of the pleasure of the gift - giving without conditions is a way of giving more than the cash itself. Think about how you can share the money you've been blessed with - we all love a new pair of shoes or the latest piece of tech, but why not look beyond that and see how you could invest in something longer term. Support a cause, help someone in need, share some with your family, buy something thoughtful for someone other than yourself. Look for ways to make a difference with what you have by sharing it around. I was going to make my "give more" list longer, but giving your "self" sums up a lot of the smaller areas. Give of your "self" - your time, your attention, your love. Volunteer somewhere, invite someone out for a coffee, do a random act of kindness, listen to that lonely person you always try to avoid, stop being busy long enough to give a little piece of yourself to other people. When we look back, it won't be how much time and money we invested in ourselves that counts, it will be the time we put into relationships that really matters. The more we give of ourselves, the more that flows back to us. Giving has the habit of filling our heart, and the knowledge that we've gone above and beyond what was needed is a reward in itself. Do you invest your time and money in others or is it closely hoarded for yourself? What legacy will you have left when it's time to depart this world? Giving, and then giving some more is where we begin to make a difference to those around us. Generosity of self and spirit - for it's own sake rather than for self-gratification - is, I think, more important than generosity with money and other resources...not to denigrate the importance of that too, of course. You don't have to do a lot to make a difference. Your advice here is spot-on, Leanne. Give without conditions. Invest in relationships. Leave a legacy! Lovely post, Leanne, and so very true. The gift of ourselves can mean more than anything else! Genetics - a Death Sentence, or a Wake-up Call? I tend to give so much of everything to other people that I have to remind myself to look after myself once in a while, too. I need my freedom, but I often compromise and "help out" because I wasn't doing anything urgent. So while I agree, giving makes you a better person, my motto needs to be to set boundaries. Enjoy your day off tomorrow, read you on Monday! This is a beautiful post Leanne. I want to continue becoming more generous in all those areas. My husband often says that when we are asked for a loan (whether money or property), it's helpful to first make peace with the fact that we might never see it again. Then it becomes a gift (in our minds) whether or not it's seen that way by the recipient. If we're unable to do that, perhaps it's best not to lend in the first place. I'd never taken that approach before, but it has definitely helped me to consider a loan (even to my kids) with a more generous spirit and an open hand. What a thhoughtful post Leanne - I must introspect some today to see how I can imbibe some of these suggestions! Without getting into details, I have given a lot of money with the hopes that it would help someone get a fresh start in life. Sometimes money does need to be given with conditions because, to the recipient, it is overwhelming and he/she doesn't know where to begin. I'm currently in the same place as Tamara. Setting boundaries is an important component of giving. Very good ideas for giving. We give both our time and money - more so the former than the latter. Volunteering has been such an integral part of our lives; and seeing the impact of the people, animals, and causes we've supported has been so rewarding. Awesome challenge and great letter! I've always been surrounded by people that begin with the letter "G" for some reason (my father, grandfather, friends ...) Now it has even more meaning. Good (another "G" word) food for thought! I am not good about giving my time but I give money. I usually donate to either a food pantry or our veterans both things that are close to me. Lovely. I recently heard a quote - the more you love life, the more life loves you - in regard to being happy, giving and having it come back to you. Living unconditionally makes such a difference in how one approaches life. It certainly gives a much better perspective. This is a lovely post Leanne - I know that I'm generous with my time and my help, volunteering, doing things for others - less so with money. This is definitely something to think about. Hi Leanne I realised reading through your post that my husband and I both give in many ways. He supports two dogs through Rspca, he donates to the deaf Society. I enter fun runs for charities. We set up bank accounts when each grandchild is born and contribute monthly plus also for birthdays and Christmas. I also give my time volunteering at my Mils aged care. So thanks for making me reflect on how we give. I am enjoying your daily posts, this one especially. I can never remember a time that I did not volunteer for one organization or another. With each new opportunity that comes along, I ask myself the same question; what is my motivation? Sometimes it truly is self-serving and I'm okay with that. As long as I am making a positive impact on another life, there is no downside. When my grandma died, I realized how impermanent physical things really are. When we first moved overseas, aside from donating so many things, most were still given away; very few were sold. Now we are doing the same thing again. My favorite Christmas gift giving is to charity. So that I'm not just randomly adopting an elephant or a stretch of beach in someone's name, I told my family I would be doing this, and asked them for a charity they support, that they would value a donation in their name. Giving of self and to self is a very important part of living life to the fullest. I like think I have a balance of both. Thanks for your thoughtful comments through the first week of AtoZ. Beautiful, important post. Now and then, I will allow myself to think about who I would and could help if I won the lottery. First, I would need to start playing!! But I know so many people who could benefit from just a little help. A week's worth of groceries, a tank of gas. School clothes for their children. Having their month's worth of prescriptions paid for. It is true that money doesn't buy happiness but it can sure buy a little peace of mind at times. I love to do small things, like buy a stranger's coffee or leave an extra tip for a busy server. 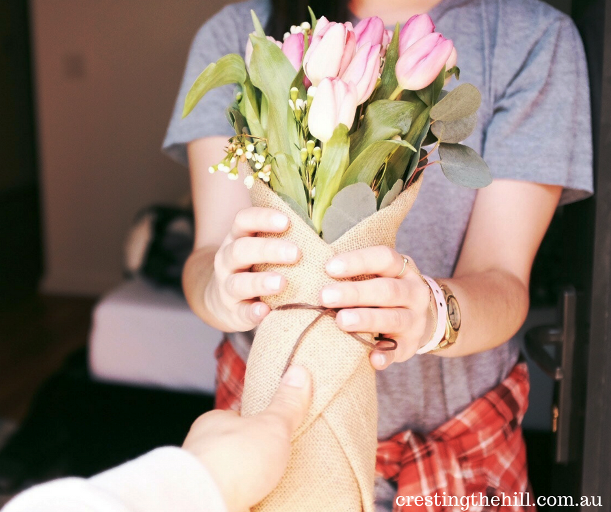 It takes so very little and can make someone's day. And in truth, it's a little selfish, because it makes me feel happy too. I'm impressed with your efforts on the A-Z challenge. Blogging every day is no small feat! Have a lovely day! Well said, Leanne! Investing in relationships and donating time or money, are some of the givings I've done. Thanks for hosting MLSTL every week while you and Sue are both busy with the A to Z Challenge this month. Now that my children are adults and don't need anything material from me, I've started giving to our favourite causes at gift-giving times. Hi Leanne, thanks for co-hosting #MLSTL with me and I've shared this on all my social media. Have a great week! Such a thoughtful and though provoking post Leanne. It is true that the happiest people are the givers and not the receivers and all too often we exist in a me me me environment and need to be brought back to earth every so often about what's important. And giving is important. Great post! 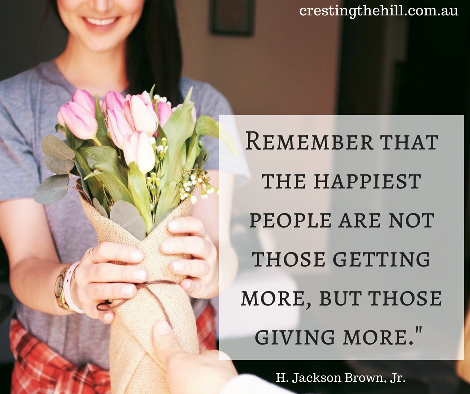 We all need to be reminded to give more! Great post Leanne, there are so many simple ways to give back. One of my favourites, which I don't always remember, is to compliment a stranger. It always has such a positive effect as people seem to be ready to be told off and are delighted when they are given positive feedback. So easy to do, and feels good for the giver as well as the recipient.